Ahhh, and finally, the most famous of all of the Haunted Mansion's 999 ghosts: the Hitchhikers. First up we have the Prisoner, a.k.a. "Gus," as all Mansion fans know him. Though nameless, all three ghosts have picked up unofficial, but widely used/accepted, names. 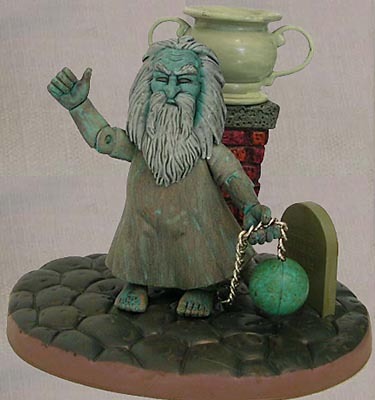 Gus is probably the least interesting sculpt of the series, basically because he's just a little old guy in a mumu. He has some decently detailed hair accentuated by the paint washes, but as far as likenesses go, he looks much more like a bearded Mark Twain than the animatronic figure from the ride. Also, his proportions are all off, making him look more like a dwarf or midget than a skinny, little, old man. He is sculpted with is left thumb sticking out, so your figure can try to hitch a ride in any passing Doombuggies that'll have him. Gus sports 11 points of articulation, not bad for a 3 3/4" figure. He's got a balljointed neck (at least as balljoint as his hair and beard will allow), balljointed shoulders and balljointed hips, not to mention articulation at the elbows, wrists and ankles (he's the only figure with back-and-forth ankle articulation). 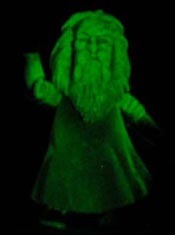 As for paint, he's cast in light blue plastic and has a gray wash under a tan wash under a wash of glow-in-the-dark paint (there's white under the gray and no tan on his beard and hair). Accessories include, and are limited to, a ball and chain (which don't glow in the dark, but the chain is metal, so that's nice) and a pot with either beans, vomit, tobacco, dirt or dead plant remains (I can't really tell) in it. For his base, Gus comes with a mound of cobblestone and two set-pieces. One is a headstone, as seen to the left. It is removable and, I assume, interchangeable with the headstones in the Caretaker set. The other piece is a really great brick column. 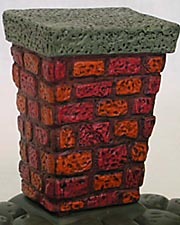 What makes it so great is its paint job: the column is cast in brick-red plastic, then has a brown wash over that, then each brick is individually painted either red or orange, and finally, there is a gray or black wash over that. To top it all off, both figuratively and literally, the top of the column is painted gray and has a black wash, too. What this all does is create a very colorful, very detailed display piece that not only draws the eye, but outshines everything else in the set. Gus has the least articulation in the set, the least amount of accessories and the smallest base but, as the littlest member of the Hitchhikin' trio, it suits him just fine. Thumbs up! Ever been in prison? Tell us on our message board, the Loafing Lounge.